Versatile frontrow Poux can play on both sides of the scrum and currently plays for Toulouse in the Top 14 having started his career with RC Narbonne in 1998. Poux was a key part of the Toulouse side that won the 2003 and 2005 Heineken Cups and went to both the 2003 and 2007 World Cups. However, since then Poux has been used largely as a replacement on the international stage. 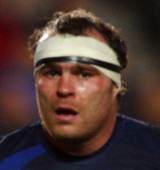 Following a year in the international wilderness - with his last appearance for Les Blues against Argentina in June 2010 - Poux was recalled to the international side for their warm-up Tests prior to the 2011 World Cup.